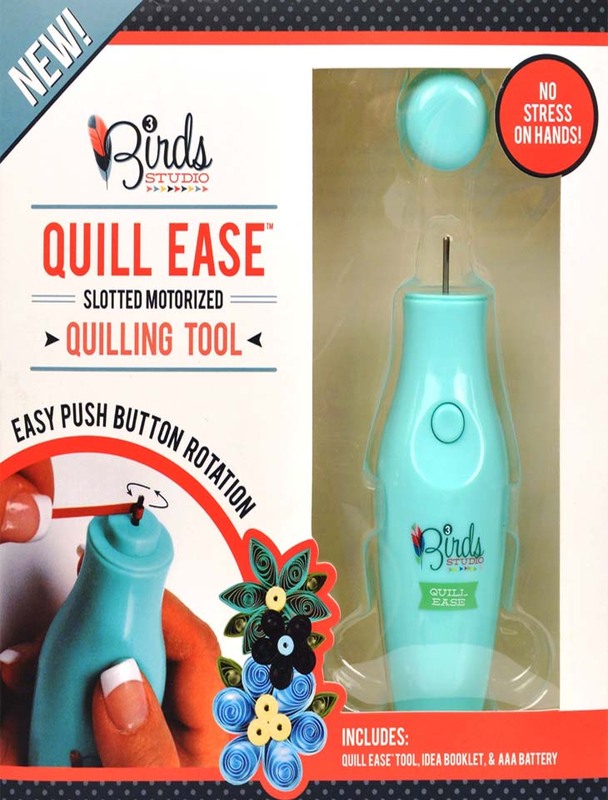 We are highly thankful to Ann Martin for permitting to upload her review write-up for 3 Birds Quilling Motorized Ease Tool here under. She is world’s most prominent craft & Art professional. 3 Birds - Motorized Quill Ease Tool. Now 3 Birds Quilling Ease Tool (Motorized) is available in INDIA with us. International buyers can also buy from here @23.61 $ USD + shipping. INDIA Price: Rs. 1500.00 (Free India Shipping) +Tax. Call for further details: +91-9327002089 for INDIA & worldwide deliveries. This battery operated tool is perfect for quickly rolling & making Quilled Shapes with easy push-button rotation. It will Quill a 12" strip in less than 2 second. Plus there is no more stress on your hands or wrist during Quilling. Includes: 1 Quill Ease tool, 1 AAA battery & instructions. Comes with a plastic circular base which helps lift off the strip with ease once it's been rolled. Battery operated. The Quill Ease was developed to save time and ease the soreness in your hands by easily quilling strips for you with easy push-button rotation. The handle is shaped for maximum comfort and comes with a top to protect the slotted shaft when not in use. 1. This is the 3rd generation tool. 2. This tool is for text weight 1/8 strips only, not cardstock. 3. Do not over apply tension while holding the strip. 4. It is built as a low power tool so the strips will not tear. 5. Ideas Booklet & AAA Battery are included.